Sasquatch, Legend Meets Science © 2006 by Jeff Meldrum, Ph.D.
December 28, 2006 Pocatello, Idaho – Sasquatch … Bigfoot. Those names have long been associated with tall, hairy creatures that appear to be half-man and half-ape. In 1978, a resident in rural Snohomish, Washington, had been hearing eerie, high-pitched screams around her forested property and her dog was agitated. One late afternoon, she could see a hairy, ape-like creature she estimated stood between 8 to 10 feet tall standing in the trees some distance from her back porch. When the Sasquatch began emitting sounds, she ran into the house for her tape recorder and was able to capture a few minutes. 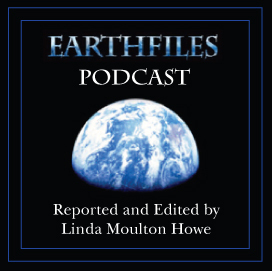 Click for podcast of Sasquatch screams and this Earthfiles report. 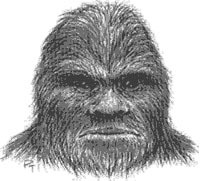 At the end of 2006, eyewitnesses in the United States and Malaysia reported seeing tall, hairy, Bigfoot-type creatures. The most dramatic incident was in Washington County, Wisconsin, on November 9, at 1 a.m. There in the woods near a place called Holy Hill, a man reported to the Sheriff’s Department that a 7-foot-tall, dark-haired animal – larger than a bear – jumped into the back of the man’s pickup, dragged out a deer carcass and took off running with it. Sheriff’s deputies never found the dead deer or the Bigfoot. At the same time on the other side of the world in the deep jungles of Malaysia, at least ten people in half a dozen regions described a Bigfoot creature and its footprints in the jungle. The distance between some of the tracks was nearly six feet. The footprints were pressed into the ground at least three inches, suggesting great weight. 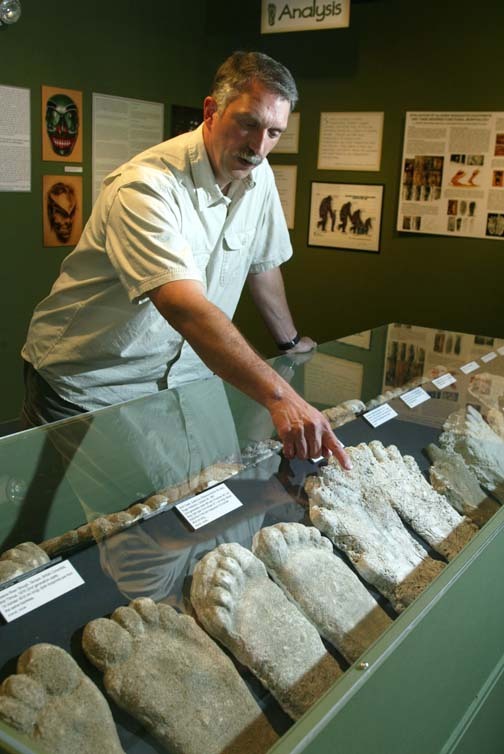 Jeff Meldrum, Ph.D., Professor of Anatomy and Anthropology, Idaho State University, with alleged plaster casts of sasquatch/bigfoot in exhibit at the Museum of Natural History, Pocatello, Idaho, that is open to the public until June 16, 2007. Photograph courtesy Jeff Meldrum. Ironically, while these Bigfoot dramas were being reported, a Professor of Anatomy and Anthropology at Idaho State University in Pocatello, Idaho, was being ridiculed for his investigations of Bigfoot/Sasquatch in the Pacific Northwest. Jeff Meldrum, Ph.D., received his Masters of Science Degree from Utah’s Brigham Young University in 1984 after studying Vertebrate Locomotion. Five years later in 1989, he received his Ph.D. in Anatomical Sciences from the State University of New York in Stoneybrook. His Ph.D. research focused upon terrestrial adaptations in the foot skeletons of African monkeys with implications for hominid bipedalism (walking, running on two legs). After that he did post-doctoral work at Duke University for two and a half years. Then he worked as Professor of Evolutionary Morphology in the Cell, Molecular and Structural Biological Department at the Medical School Campus of Northwestern University in Chicago. By 1993, Jeff Meldrum became Professor of Human Anatomy at Idaho State University. In November 2006, Prof. Meldrum had participated in a Discovery Channel television program about Bigfoot/Sasquatch, and his new book entitled, Sasquatch: Legend Meets Science was released in September 2006. 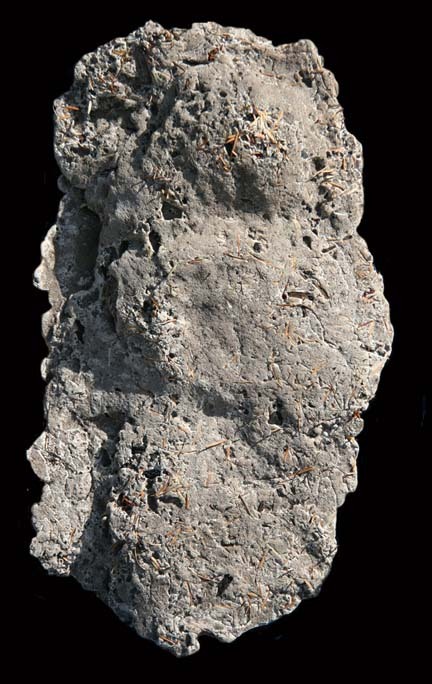 Prof. Meldrum also has more than 200 plaster casts of alleged Bigfoot/Sasquatch footprints – some of which he has gathered himself from field investigations. But the media spotlight on his work provoked criticism from some fellow faculty members. Then a local Associated Press reporter took the angle that Bigfoot/Sasquatch sightings are hoaxes. The criticisms reached the internet where one false story even had Prof. Meldrum stripped of his tenure and fired for politically unacceptable research. Recently I talked with Prof. Meldrum about the unjustified attacks against him in the context of his distinguished academic career and his near-conviction that there is an unidentified species out there. August 2005, searching for Sasquatch in Cascade mountain range of Washington State. 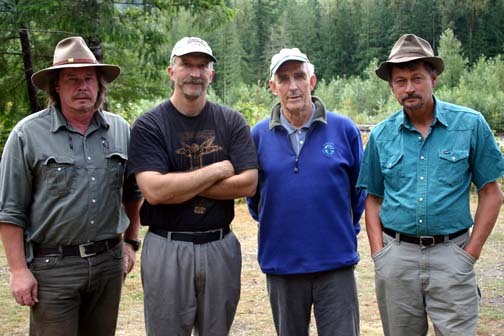 Left to right: Richard Noll; Prof. Jeff Meldrum; wildlife photographer and author, Peter Matthiessen; and John Mionczynski. Photograph © 2005 by Richard Noll. “WITH THAT KIND OF BACKGROUND AND THE FACT THAT YOU TAKE THE SASQUATCH SERIOUSLY, I WOULD THINK THAT EVERYBODY ELSE SHOULD TAKE IT SERIOUSLY? One might think that (laughs). I have colleagues who say that I am a ‘believer;’ therefore, I am no longer objective. That is not the case. I have always rejected the label of ‘believer’ and its misapplication. It is used in a very derogatory sense. Belief, for most people, carries the connotation of a position of faith – one accepts a tenant or conviction in the absence of conclusive proof. I have certainly not done that. I don’t know for a certainty if Sasquatch exists or not, by the standards of scientific methodology. MEANING THAT YOU DON’T HAVE THE BODY. That’s right. But the charge that science doesn’t begin until there is a body is absolutely baseless and ill-founded. It would be unscientific to ignore the evidence that is available and to just simply wait sitting on one’s hands for a body to be provided or drop into one’s lap. My position is there is ample circumstantial evidence, even physical evidence in the form of hair, which defies identification. That situation in itself should be perplexing to most rational people. If there are strands of hair, which are incontestably hair – not some artificial fiber, and yet no professional hair identifier analyst can attribute them to a known animal, common or uncommon, is itself a perplexing situation that is worthy of our consideration. THAT LEADS TO YOUR NEW BOOK. HOW DID THE BOOK COME ABOUT AND WHAT DO YOU THINK IS THE STRONGEST EVIDENCE YOU HAVE PRESENTED SO FAR IN THAT BOOK? I became involved in this when I was confronted with a set of footprints. That’s what really pulled me in. Once the footprints were in front of me, this was a very clear set of very fresh tracks about 35 to 45 in number along a muddy farming access road in the foothills of the Blue Mountains outside of Walla Walla, Washington. There was no room for wrong identification. It was either a hoax; or it was the trace of a living animal. Given my background that we just discussed, I was in a particularly opportune position to render reasoned opinion on that. I was impressed to the point where I felt compelled to pursue the question a bit further. WHAT WAS THE DATE AND TIME YOU WERE THERE? WHAT EXACTLY IN RELATIONSHIP TO WALLA WALLA? It’s about a 20 minute drive to the east of the northeastern corner of Walla Walla, up into the foothills to a place called Five Points because of the intersection of five rural roads nearby. It occurred in February 19, 1996, just over ten years ago. HOW LONG WERE EACH OF THOSE PRINTS AND WHAT WAS THE DISTANCE BETWEEN EACH ONE? Where they were just strolling along the dirt road. Something had apparently spooked it because it spun, made a hairpin turn, and began walking a little more briskly. These footprints were just under 15 inches in length. I could easily match the track, about 3 feet or 2.5 feet. But then when it was apparently spooked by presumably a car coming down this gravel road late on a Saturday night, early Sunday morning, it literally made a spinning turn and started walking back, glancing back over its shoulder as indicated by the right foot angling out at 45 degrees every couple of steps. Then it took off and literally began running on the front half of its feet. Its heels were not making contact. The stride nearly doubled in length. The footprints, as it traveled down across this fallow stubble field, it was leaving full length imprints, very deep, 2 to 2.5 inches in the soft, moist, tilled soil, and made its way back across the field towards the cover of the ditch, where the tracks were lost in the ditch bed of hard gravel and sand soil. Sasquatch full-length track on left beside half-track on right. Photograph © 1996 by Jeff Meldrum. WHAT IS A TYPICAL LARGE MAN’S FOOT LENGTH? Typical is probably between 10 and 11 inches. Size 10 ½ is probably one of the most common sizes for United States males. When you get up to 13 inches to 13.5 inches, you’re up to about 1% to 2% of the male population. Beyond that, a 14-inch to 15-inch foot, you’re talking about probably .5% or .1% of the population. So, it’s an exceptionally large footprint. CAN YOU TALK ABOUT WHY THIS FOOTPRINT IS NOT HUMAN? Yes, one of the things – this is what really grabbed my attention was that in several of the tracks were these half tracks where the heel was in the air, but not in the way that you or I would run down the beach and leave a small imprint with just the ball of our foot and the five toes. This imprint comprised the entire half of the foot, in front of what I would infer would be the position of what is called the transverse tarsal or mid joint, which in humans is quite stable. It screws into a locked position that helps to support the longitudinal arch, the arch along the length of the foot. That is a very characteristic feature of the human foot. But these track feet were very flat and then exhibited this sign of mid-foot flexibility, which is an ape characteristic. The mid-tarsal break, or the ability to flex the foot at that mid point is an adaptation present in apes – particularly present in apes – that use a grasp/climbing adaptation in their locomotion. They have a robust big toe that diverges out and opposes the lateral four remaining digits in a pincher grip as the ape climbs up an incline, like a tree trunk or branch. In order to maintain that grasp, the mid-foot flexibility allows the levering action of the hind part of the foot, the heel segment, to flex relative to the front prehensile portion of the foot. It’s that interesting combination of features that is present in the Sasquatch foot that really caught my attention. 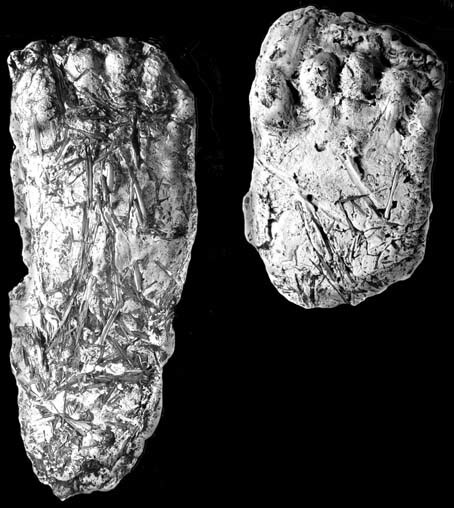 It had a big toe that was no longer divergent, like in a chimpanzee or gorilla, but yet it seemed to retain that mid-foot flexibility and the toes were still noticeably long. That was the key because in order for the toes to remain long, they have to be spared the bending portions that we impose on our feet, on our toes in particular, when we push off at the latter part or end of our step. But if the foot is flexed in the mid-foot and pushing off from the anterior part of the foot instead of through the big foot, then the toes could be spared those bending stresses and maintain some of their length and lend the foot a greater degree of prehension than is present in the human foot, especially in the western human foot confined in shoes most of its life. All that taken together is really an elegant adaptation for the habitat in which these animals supposedly are in, which is very broken, rough terrain with lots of steep inclines. This allows them to navigate through it much more efficiently than we can with stiff boots on. These were clearly not made by a simple set of carved feet strapped to someone’s boots tromping in the mud opportunistically taking advantage of that softer soil! They were not. They could not have been, in my estimation. If you were using static, stiff feet, it would have required – due to the variation from level walking to walking up inclines and running down across the soft soil – it would have required at least three sets of varied footprints with variation in positions carved into the tracks and an additional set to be used in those instances where just the front half of the footprint left an imprint. A stiff, straight foot could not be used there to make the half tracks where only the fore part, or front half, of the foot left deep imprints. So, based on that, it just seems very unlikely. I guess you never say never. But the remarkable consistency in some of the features: the presence of the half tracks; the presence of the mid-tarsal pressure ridge that was evident in this particular set of tracks. Those physical facts spurred me on to look for other examples. So, I began to identify other incidents where half tracks were identified. The proportions were similar, the context was similar. There were other examples of mid-tarsal pressure ridges, which occur when the foot makes full contact with the ground. But then as the step proceeds and the heel is elevated, the pressure is concentrated over the fore part of the foot proportionally because half of the foot is bearing the entire body weight. It will sometimes create a pressure ridge, which is a release of pressure where material is extruded behind the foot, behind the contact area of the foot. As I looked for more examples of that, more of them popped up with similar configurations, similar placement and proportion, and as those examples continued to accumulate, it just became more and more unlikely in my mind that these were just a series of spurious hoaxes. A sketch based on Julie Davis eyewitness account of August 5, 2000, encounter with 8-foot-tall Sasquatch. WHEN IT COMES TO EYEWITNESS REPORTS OF ENCOUNTERS WITH THESE BIG SASQUATCH/BIGFOOT CREATURES, WHICH ONE DO YOU KNOW ABOUT THAT HAS THE MOST DETAIL AND SUBSTANCE? The one that has always impressed me is the experience of Julie Davis (former instructor at the University of Colorado Law School) in August 2000. Julie is very experienced in the outdoors and is very familiar with bears. She has hiked solo on the Continental Divide trail through much of Colorado. She is an avid goat packer. She was out with a couple of her goats and dogs in a very remote area of southern Colorado in the San Juan Mountains. She had gone off trail to get a little more secluded. Even in that remote area, she was still bumping into other hikers on the trail and she just wanted seclusion. She went several miles off trail to a nice meadow with a lake and set up camp. She was sitting on a rock playing a recorder. Upon arriving, she said her dogs had acted up. She thought this was bear country and there might be a bear stalking the meadow. Then the dogs were acting up more and she didn’t want the dogs to tangle with the bear, so she had taken them and stuck them in the tent. She grabbed her pepper spray. As she stepped out of the tent, she noticed the goats were very attentive to something behind her tent. She stood up and turned around and was there face-to-face with a Sasquatch standing in broad daylight right behind her tent about twelve feet away. She locked eyes with this individual. She told me she was looking at something she had never seen before. It stared at her and then glanced at her goats and then looked back at her and then looked at the goats. She had a very good look at its face and was able to describe its facial features. And then there was a sense of, ‘I won’t bother you if you don’t bother me.’ At that point, it turned and strode off toward the tree line. She remarked that its grace and fluidity of its gate given its bulk and size. It glanced back at her and then disappeared into the woods. “Medium-chestnut fur like an Irish setter’s. Big brown eyes. From my work with the Great Bear Foundation in Montana, I’ve had a lot of time to get to know what bears look like up close. This animal was bigger than any bear. Prof. Meldrum: “One of the things that stuck in my mind the most because it was an odd observation, I thought. Julie noted there was short hair across the bridge of its nose. It did not have a beard per se, but it had hair on its face, which came up quite high on its cheeks and was continuous right across the bridge of its nose. That struck me as odd because if you have the vision of a chimpanzee or gorilla, neither have that feature. But I reached to my bookshelf and got a book, which had some very sharp portraits of adult male orangutans. Sure enough, they have very short hair that extends right across the bridge of their nose. WHAT ABOUT THE EYEWITNESS ACCOUNTS WHERE THEY HAVE SEEN A SASQUATCH STANDING IN FRONT OF THEM AND THE EYES WERE RED? Right. One of the early encounters I had with a witness, Darrell Owen, in northern California, laid claim to having a videotape of one in which the Sasquatch was under a ridge reclining and when they approached, its eyes glowed red, as if they were self-illuminating. I spoke with the fellow at the video lab who enhanced and highlighted and provided stills of the images for Darrell Owen and basically he said he could not see any of the things Owen described. There was no eye shine that he could see. I’m always a bit skeptical of the self-illumination descriptions. But if this Sasquatch animal has proportionally large eyes in order to gather light for nocturnal behaviors, a widely dilated pupil would produce a red eye effect just as you get with the flash on an individual with very pale blue eyes, or dilated eyes under dim light conditions. WHY DO YOU THINK WE DON’T HAVE A BODY OR A SKELETON? It still is perplexing that we haven’t, that someone hasn’t stumbled on something. But we’re making discoveries all the time. In paleontology, new species are found. If this is a large body omnivorous primate, it probably has no natural predators. It would be at the top of its food chain. If it’s a large ape, it probably has a very long life expectancy of 40 to 60 years perhaps. It reproduces rarely, if we can extrapolate from the great apes. Births are rare and infrequent and widely spaced. An adult female orangutan may give birth to only 4 individuals in her entire lifetime with anywhere from 4 to 8 years between births. So, given a very rare population with long life expectancy, with infrequent reproduction and no natural predators – when death occurs, it’s a rare event. Two, it’s going to be a natural event. Therefore, animals that die natural deaths as they become old and decrepit and ill, they secret themselves off and once they pass away, insects and other predators eat the remains and the skeletons are carried off by scavengers, by porcupines and rodents. People don’t realize that a porcupine can make in very short order gnaw a large bone to nothing. I’ve found elk bones which have been chewed by porcupines and there is just not much left even to identify which particular bone it is. They are just chewed down to almost nothing. Anyway, the second factor then is the physical environment. That is where these Bigfoot animals are most reported are wet, coniferous forests. Particularly in the Pacific Northwest, these are soils that are largely volcanic-derived that are notoriously acidic. Acidic soils and conditions are not conducive to preserving bones. So, what scavengers haven’t eaten, the physical environment quickly deteriorates and decomposes. In a short time, there is not much left. If you stop and think that every year, literally thousands of deer die of winter kill from predators and succumbing to the rigors of winter. Yet, when you go out for a hike in the springtime, you don’t find the floor of the forest littered with deer carcasses. The carcasses are very efficiently recycled. Could Sasquatch Live in Subterranean Tunnels? WHAT ABOUT THE IDEA THAT THERE MIGHT BE SOME SUBTERRANEAN TUNNELS RUNNING IN THIS COUNTRY FOR REASONS UNKNOWN, BUT THESE SASQUATCH/BIGFOOT MIGHT HAVE A SUBTERRANEAN LIFE? It’s an interesting proposition, but one that is based on meager or non-existent evidence. Yes, there are lava tubes and caves in the Cascade Mountains, but no one has ever documented or demonstrated the existence of any extensive network that could be utilized for travel and habitation by an unknown population. I don’t think you have to resort to that scenario. I think their rarity, their behavior – if you talk to any person who has experience with wildlife photography and trapping of exotic animals. Invariably, they will tell you that the most difficult animal to deal with, to locate, photograph, capture – are animals that are rare, solitary, that are far ranging and are nocturnal. All of those aspects apply to the Sasquatch – plus, we have an animal that has an intelligence at least on par with the great apes, if not more so. NOW, I’M TALKING TO YOU ON DECEMBER 19 AND YOU ARE SITTING IN YOUR OFFICE AT IDAHO STATE UNIVERSITY IN POCATELLO, IDAHO, RIGHT? WHAT IS THIS STORY THAT CIRCULATED ON THE WEB THAT YOU HAD LOST YOUR PROFESSORSHIP AT THE UNIVERSITY BECAUSE OF YOUR BIGFOOT/SASQUATCH RESEARCH? What happened was that when we were anticipating the release of the book, which was only to be that a serious professor writes a book about a topic that is not often taken so seriously and yet treats it in a very scientific fashion and has the endorsements of the likes of Jane Goodall and George Schaller. Unfortunately the AP reporter they sent out thought there was a different story to be told (laughs). He barked up a different tree and found a couple of skeptics on campus who had in the past said negative things about my research and my preoccupation with the subject. He created a controversy and quite frankly misrepresented. My tenure has never been questioned or placed in jeopardy, nor have I ever talked with the reporter about how long I might be at ISU. Never happened. BUT YOUR TENURESHIP AT IDAHO STATE UNIVERSITY IS IN PLACE AND IS NOT THREATENED? 2005 – Did Sasquatch Upend Rock As “Calling Card”? 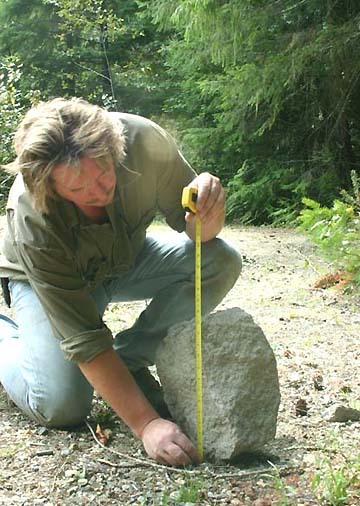 Richard Noll measuring height of upturned rock found in Cascade mountain camp site in August 2005. Photograph © 2005 by Richard Noll. In August 2005, Prof. Meldrum had camped for in Washington State’s northern Cascade mountain range with John Mionczynski, Rick Noll and writer and photographer Peter Matthiessen. Peter Matthiessen had trekked with the Wildlife Conservation Society’s George Schaller through Nepal looking for the snow leopard and keeping their eyes out for yeti, the Himalayan version of Sasquatch (The Snow Leopard © 1978). Prof. Jeff Meldrum: ” In 2005, Peter read my book in its pre-publication form and wrote a review. He was so intrigued by it that he asked if he could join us in the field. So we invited him to the north Cascades and he came the last several days of the multi-week outing. I left first and the others were still in camp on their last day to pack for travel back home. In the morning when they got up, Peter and John Mionczynski and Rick Noll noticed a rather large stone had been upended. The stone that was about two feet by one feet and rather discoid in shape, oval and rather flat, only about 6 inches through the center. It was on end like a tombstone, stuck into the soft soil. Richard Noll: “As we were getting ready to pack up our camp, Peter and John noticed this rock not being there the day before. They looked around and found where it might have come from and found the track in some old fire ash. They called me over and asked what I thought of it and did I see anybody move the large rock to that spot. I hadn’t. Tents were further away and no one was moving rocks. The rock was about 12 feet away from where the track was and where the track was found is the only place that rock could have come from. There were other similar rocks near the track. Jeff Meldrum: ” After asking each other if anyone had upended the rock, they went over to look more closely. That’s when they noticed there was a line of tracks that came out of the thick forest across the dusty turn about. WHICH MEANS THAT HERE WERE SOME EXPERTS OUT LOOKING FOR SASQUATCH ASLEEP AT NIGHT AND A SASQUATCH COMES AND LEAVES A CALLING CARD? That’s what it seemed to be. Ironically, up to that point, we had camera traps surrounding the site. But I was the custodian of most of that stuff and it had all been taken down the day before (when I left). The guys made casts of the prints in the dry soil, which blurred details some, but you can see the toe row and an interesting pressure ridge about mid-foot. And that was on the final day, which was odd. Who knows? The footprint is obviously open to interpretation. BUT SOMETHING HAD TO BE ABLE TO LIFT UP THAT ROCK? 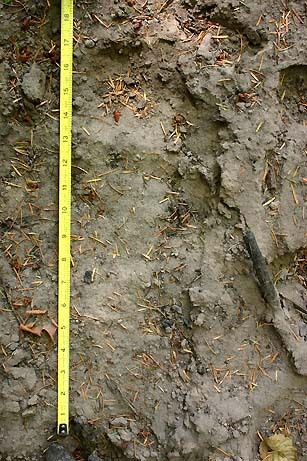 August 2005, large and deep footprint measuring a little more than 18 inches in the northern Cascade mountain range of Washington State. Found on last day of camp where a rock mysteriously had been raised on end and stuck into the ground. Photograph © 2005 by Richard Noll. August 2005, another large and deep footprint at the northern Cascade mountain camp site where a rock had been mysteriously raised on end and stuck into the ground. Photograph © 2005 by Richard Noll. 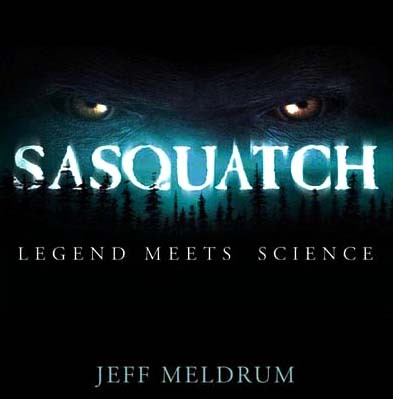 Sasquatch, Legend Meets Science © 2006 by Jeff Meldrum, Ph.D. Click here for Amazon.com. 12/31/2002 — Deer Dropped Into New York Maple Tree – From Where? 07/21/2001 — Missing Link Between Humans and Chimpanzees – Ethiopian Forest Bipeds 5.8 Million Years Ago?